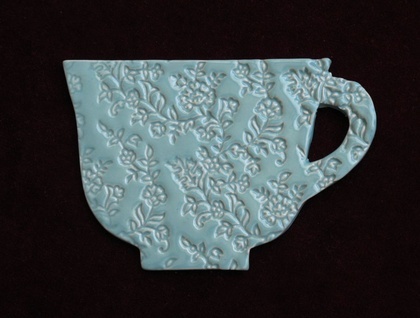 This original ceramic Teacup design will look great on your coffee table!. It features a deep impressed floral design. 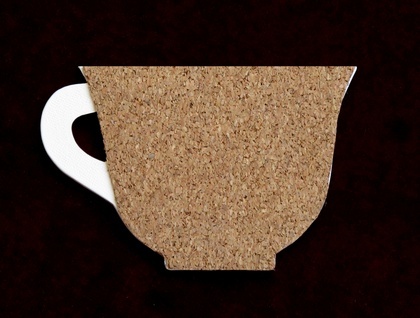 It has a cork backing to protect your surfaces and keep it in place. You can use it on a table or attach a hanger to the back for your wall.. It has a beautiful glossy Turquoise glaze finish. It feels so nice to touch! Mudbird Ceramic Ware is perfect as an original gift. Each piece is hand cut from NZ White Clay, then stamped/impressed using a mixture of new & antique textures, stamps woodblocks & found objects. After drying & smoothing they are fired once, under-glazed then fired again.